Remember the boneless chicken? Ofcourse you do. 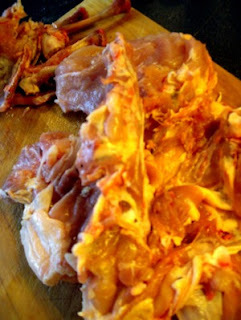 What was left of the carcass and bones is delicious as a base for good chicken stock. I made my stock of the bony bits of the two chicken, adding 3 pints of water and 3 cubes of chicken stock. I did not have much greens to add, but I used some leftover woody asparagus stalks. Allow to simmer on a very low heat for two to three hours reducing the liquid by 1/3. Take out the asparagus and carcass, and cool down quickly. Store in the fridge for dinner the next day.